Robert Franklin: [administering chimp intelligence test] Okay, okay. Here you go. And let's go again. Will Rodman: Which one's this? Number nine? Robert Franklin: Yeah, this is number nine. Bright Eyes, we call her. Are you watching this? This is unbelievable. Robert Franklin: Oh, my God. Oh, my God. Will Rodman: How many moves was that? Q: What's the quote shown under the table in the lab right before Caesar notes the intelligence-enhancing medicine? Q: How does the viral gene therapy work? And why is the first injected, whereas the second is administered by inhalation? To begin on a tangent before evaluating the film, before summer 2011, I had not seen a decent prequel film. Prequels to films are often made when there is either a rich back story behind the originals or the producers are wanting a little more money from a particular franchise (see the Star Wars prequels). The problem they present is that film- makers have to construct their work, with the knowledge that the audience knows how it ends. One of the greatest things about seeing a film for the first time is the surprise and anticipation, to removing that can detract a lot from the overall impact of the film. But this summer I have had the pleasure of seeing X-men First Class, and now Rise of the Planet of the Apes - two excellent prequels to series that I didn't care for previously. 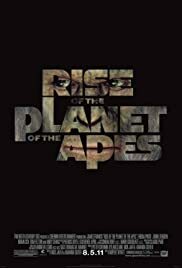 Rise of the Planet of the Apes (RPA from now on, I can't bear typing it) is not only a triumph in CG animation, but as a stellar science fiction film, that remembers that films are infinitely more engaging when the audience actually cares for the characters on screen. Too often do I see films with a high premise that forget to flesh out their characters, leaving us to run around in mindless, weightless explosions with nobodies who we know less than 3 things about (cough, Transformers 3). Yes, RPA is about super intelligent apes that ransack cities and take on armed forces with little more than what surrounds them, but before we get to that there is an enormous amount of development from the main protagonist; Caesar. Although the advertisement trumpets James Franco, John Lithgow etc, the real star here is Andy Serkis, along with millions of dollars worth of CG animation to create the most expressive animated creatures on film. 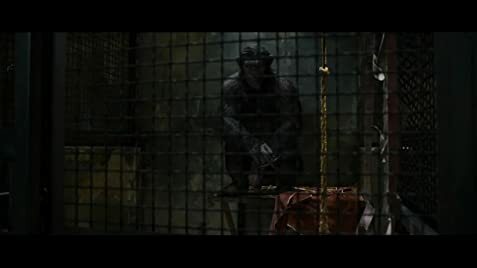 Even with Avatar, using real humans, pales in comparison to the amount of detail going into every single one of these apes; there is not one second in the film where you cannot understand one of the primates intentions - you could practically vocalise them yourself with the refined eye movement, body language that clearly separates Caesar from his more primitive relatives. Needless to say, Caesar's performance is flawless; after all this is the man who brought Gollum to life, but he captures the screen with an entirely wordless performance, which to me is the greatest part of the film. I felt for Caesar more than any other character in this film, and he did it without saying a word. Eat that Michael Bay. I was almost in tears at one point during one of Caesar's more emotional scenes for Christ Sake - although a chimp, the heightened intelligence really gives him just enough human characteristic to be above the uncanny valley while still behaving like an animal. The humans in the film were what I considered weakest in this film; not any of the performances were bad, but a little more development in some minor characters and some tweak in the writing here and there would have made this a perfect 10. Tom Felton (Draco Malfoy) felt a bit off to me; he was cruel but almost in a cartoon way, though I suspect that's more to do with ill writing than any personal issues. The main cast are good, though at it's current length, I think more development with James Franco's character wouldn't have gone amiss, but then again, this might have thrown off the pacing. Another thing I love about this film is that while taking a sharp diversion from its roots in terms of gradual characterisation, it does a superb job of delivering what everyone inevitably came for. A massive Chimpocalypse. A simian uprising that sees the downtrodden apes taking up arms against humanity, and in three words: it's f - ing cool. Made all the more exciting by the anticipation and the feel for these characters, the marvellous point about Caesar's character is that we sympathise with him, we understand why he leads an ape army AND WE SUPPORT HIM. A super intelligent ape is rallying a chimp attack force to free themselves from their confines, cause mayhem, disrupt order and ultimately rule humanity AND WE WANT THEM TO. And for that I applaud. I love a film that makes us look inwards at ourselves and question our own moral codes and attitudes to events in life (this one clearly representing a case of animal cruelty) that make us conclude that WE are indeed the bad guys, and we need to change. Living in a small, rural middle-class society (like myself) or a well-developed area often makes mainstream audiences forget about those less fortunate than themselves, and what it drives them to, or in this case, what having too much drives us to, and it's refreshing to see something that reminds us of how much of a plague we are to the rest of the planet. Overall, I would say a strong 9/10, perhaps not quite reaching the highs that First Class did, but by God, was it more consistent - definitely watch this one, and stay after the credits. 115 of 165 people found this review helpful. Was this review helpful to you?